Way Fruit Farm offers all sorts of things that are good to eat; from different types of fruit to a variety of local food products from places like Tait Farm Foods and Hogs Galore. But their bread and butter, what put them on the map, is of course apples. As a big fan of Way Fruit Farm, I can tell you that I see a lot of people buying huge amounts of apples for all sorts of recipes. I met a woman there last year who was baking apple pies for recipes, planning on giving them as gifts…a total of 25 pies! Apple pies certainly are a great way to use Way’s apple bounty, but I recently had the opportunity to talk to Megan Coopey, who with her husband Jason are co-owners of Way Fruit Farm, about some other recipes for apples. 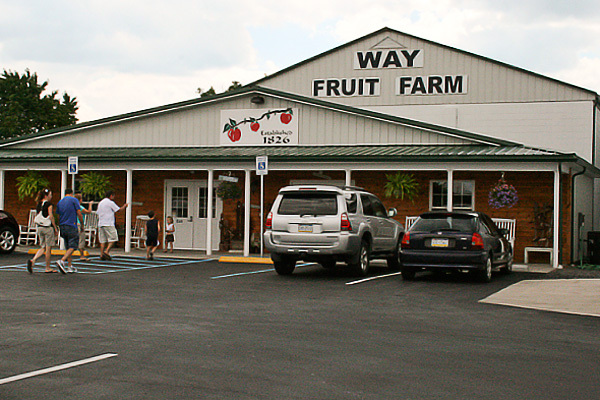 Jason and Megan are two reasons to visit Way Fruit Farm, always friendly and helpful, and Megan was glad to help by giving me several fantastic recipes that would make a fantastic addition (or additions) to the Holiday table. 1 1/2 c. half and half or light cream. Combine all ingredients until well blended. Pour into prepared pie crust and bake at 425 degrees for 12 minutes. Reduced heat to 350 degrees and bake for 40 minutes or until filling is set. Cool on rack. Serve with whipped cream. * This is a nice alternative to pumpkin pie, because it has that same creamy texture, but an apple flavor instead! Mix all ingredients except apples together for 2 minutes. Add raw apples and stir just to incorporate. Spread batter into a 9x13 inch pan and sprinkle the top with chopped nuts (pecans or walnuts). Bake 45 minutes at 350 degrees or until a toothpick inserted in the middle comes out clean. Place zest and juice of oranges and lemon in large bowl. Peel, core and slice the apples and toss them in the juices. Add brown sugar, butter, cinnamon and allspice. Pour into glass or ceramic baking dish and cover. (Do not use metal.) Bake for 1 1/2 hrs or until all apples are soft when poked with fork. Stir with a whisk until smooth or serve as is for a chunky applesauce. Best served warm. Great as a dessert plain or with ice cream or as a topping for pancakes!